"It should be pointed out that the sun paranoia of the American Cancer Society has resulted in dramatic increases of many types of cancer due to a lack of vitamin D. Sure there are fair-skinned people who should minimize sun exposure, and every person should avoid burning. The sunscreen nonsense has gone wild. Enjoy the sun – your health may depend on it." This article by Bryon Richards of Wellness Resources is further encouragement that I am on the right track when criticising the health authorities and advocacy organisations, like the Cancer Society over their misguided and misleading sunsmart policies. Richards discusses the links between vitamin D deficiency and obesity and inflammation. Inflammation is the prime driver behind cardiovascular disease, the leading killer in modern societies. Top up your vitamin D levels now! How much supplementary vitamin D should we be taking? "If you use suntan parlors once a week or if you live in Florida and sunbathe once a week, year-round, do nothing. However, if you have little UVB exposure, my advice is as follows: healthy children under the age of 2 years should take 1,000 IU per day—over the age of 2, 2,000 IU per day. Well adults and adolescents between 80–130 pounds should start with 3,000 IU per day while those over 130 pounds but less than 170 pounds should take 4,000 IU per day. Those over 170 pounds should receive 5,000 IU per day. Two months later have a 25-hydroxy-vitamin D blood test, either through ZRT or your doctor." Where can I get a Vitamin D Blood Test? In New Zealand and Australia, go to your general practitioner. However; we have a serious problem here in New Zealand: Pharmac, the funding arm of the Health Dept has sent out an instruction last year to all doctors urging them not to do this test because they consider it unnecessary and a waste of money. So do not be at all surprised if your doctor refuses. If your doctor refuses, simply tell him/her that you will take your business elsewhere. You are the consumer, you pay your taxes and you have the right to know this critically important health information. In three years, not one person I have had tested has come back with an "optimum" result! Vitamin D deficiency is epidemic. There is no arguing this fact, yet most doctors, including the Health authorities ignore this. Is it because vitamin D is cheap, non-patentable and the sun is free? Less is more - so long as it is often! If your doctor does decide to prescribe you a vitamin D supplement, the odds are it will be a weekly or monthly tablet of 20,000iu of synthetic vitamin D. This is outrageous because it is a big body hit of a synthetic sunstance and we do not know the long term consequences of this. It makes so much more sense to give small doses of the natural form often rather than these big hits - I can not understand why they do this other than out of sheer ignorance of basic human nutrition. Where can I purchase vitamin D? 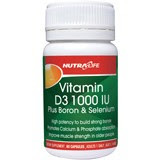 You can get high quality, low cost vitamin D from my website store. I recommend that you get a mix of the Thompsons and Nutra-Life formulations. Switch from one to the other over the winter (Nutra-Life has some added minerals that we need but do not want to overdose on). Most children can easily swallow these small capsules. If not, then break the capsule open and mix the contents into their food.